Maintaining the overall oral health of children is as important as entering preschool. Caring for the teeth and other oral structures is best when started at an early age. It helps prevent undesirable dental issues to arise. Complete dental care does not merely mean brushing, flossing, and rinsing but it includes comprehensive dental treatments as well. The first step in attaining a healthy mouth is to begin oral practices as early as possible. However kids will be kids, they still need the assistance of their parents. Parents must make it a habit for your kids to observe proper oral hygiene. It is also recommended to assist then in undergoing dental treatments that can help in the diagnosis, prevention, and restoration of their oral health. At Avalon Dental Group, we offer Pediatric Dentistry services to address the dental issues of your children and provide treatments that would satisfy all their dental care needs. 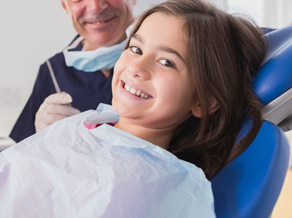 Pediatric Dentistry refers to the procedures that focus on children’s dental health. It is a specialty which adapts the procedures from general care and other specialized dentistry to provide the children with comprehensive dental treatments. It requires certain training, tools, treatment procedures, medical knowledge, and expertise to be performed. A dentist that is specialized in the dental services for children is called a Pediatric Dentist. They ensure that the different dental procedures are done effectively and efficiently as possible to provide the best possible care for children. Maintain children’s overall dental health: Pediatric Dentistry keep your child’s mouth clean and healthy. Visits to the dentist help you monitor the health of your child’s teeth. Prevent arising dental issues: Dental caries and tooth decay are interrelated. Gum, tooth decay, as well as other dental issues and disease, can be detected through pediatric dental services. Once detected necessary treatments could be performed to prevent it from worsening. Ease dental anxiety and fear of children: Dental visits are one of the sources of the older patient’s anxiety, and it goes especially to the children. Children can feel anxious or uncertain if they do not know what to expect. Through the treatments under pediatric dentistry, they are made aware of its proper purpose for their health. It can even help prevent the development of dental fear and anxiety in children. Develop good dental habits: Aside from maintaining the oral health of the child, visiting the dentist regularly teaches the child good habits of taking care of their teeth at an early age. It helps children to learn how to use a toothbrush properly, how to floss and the proper mouth rinsing. It is also explained to the child how it works and what does it achieve. Treat existing dental health problems: Pediatric Dentistry focuses on providing your child dental services to protect and treat your child’s teeth. It also includes diagnosis, prevention, and restorations to address certain oral concerns. Avalon Dental Group is always ready to take action involving you and your child’s oral health. If you want to experience secure Pediatric Dentistry Services in Sugar Land, TX, contact us and book your appointment.